Some of you have watched this transformation unfold slowly over the last 6months or so via FB. For those of you who have not I apologize for holding out on you! As most of you know I am currently on my second Trek carbon frame after my OCLV 5500 cracked both chainstays & part of the BB shell. 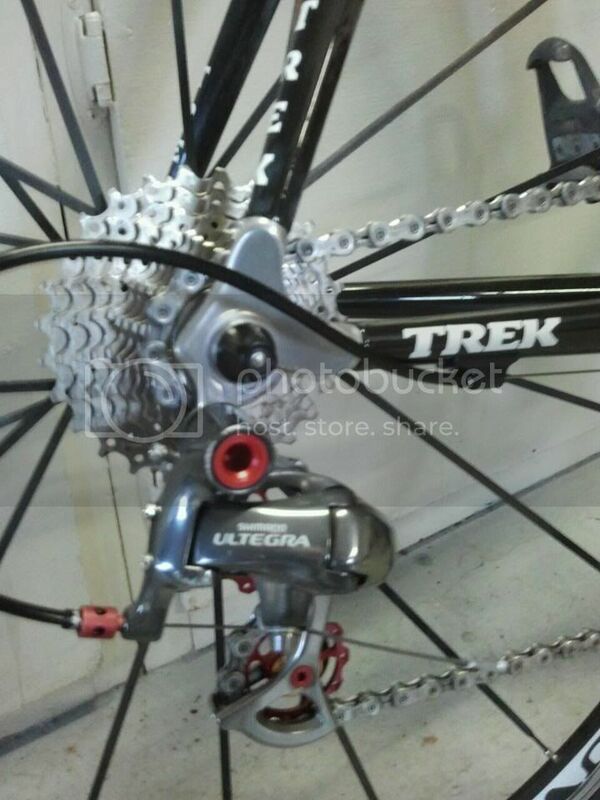 The good news is that Trek was VERY fast in replacing it due to their lifetime warrantee program. 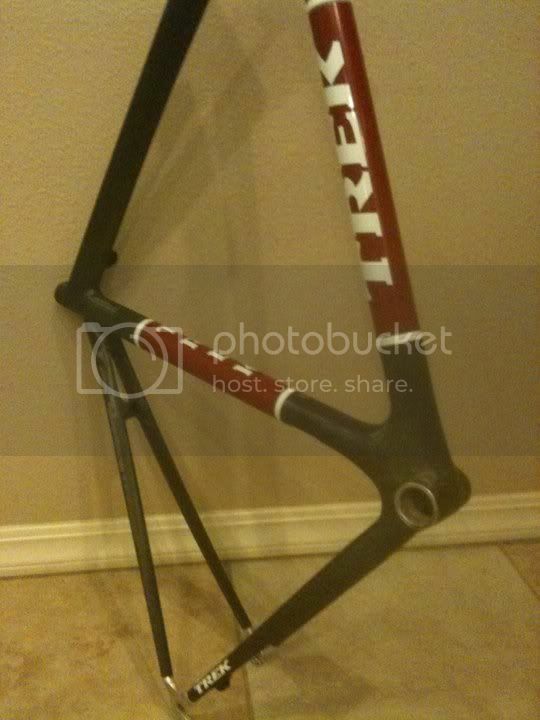 The bad news is I didn’t get to pick my frame color & was stuck with a VERY bright red frame that I totally hated. 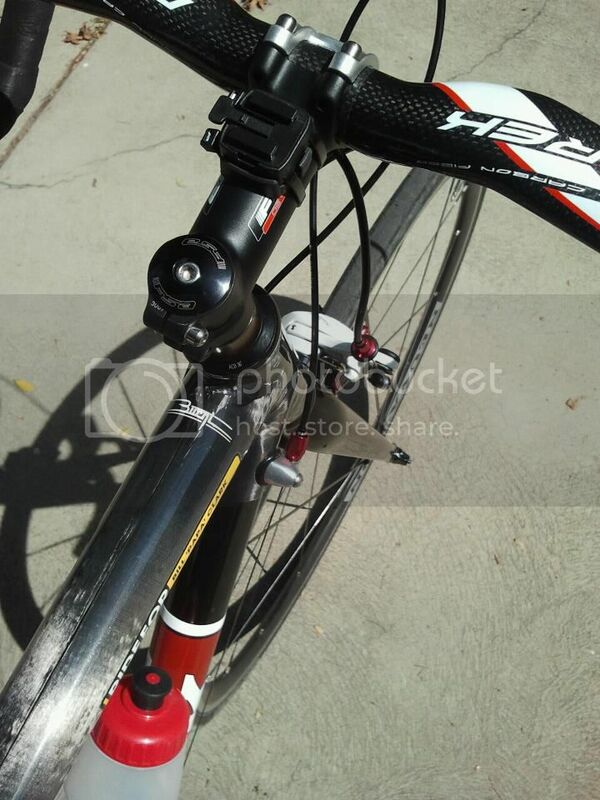 After getting home from a VERY wet & dirty Tahoe century last June I discovered another crack in the paint all the way around the seat tube just below the front derailleur hanger. 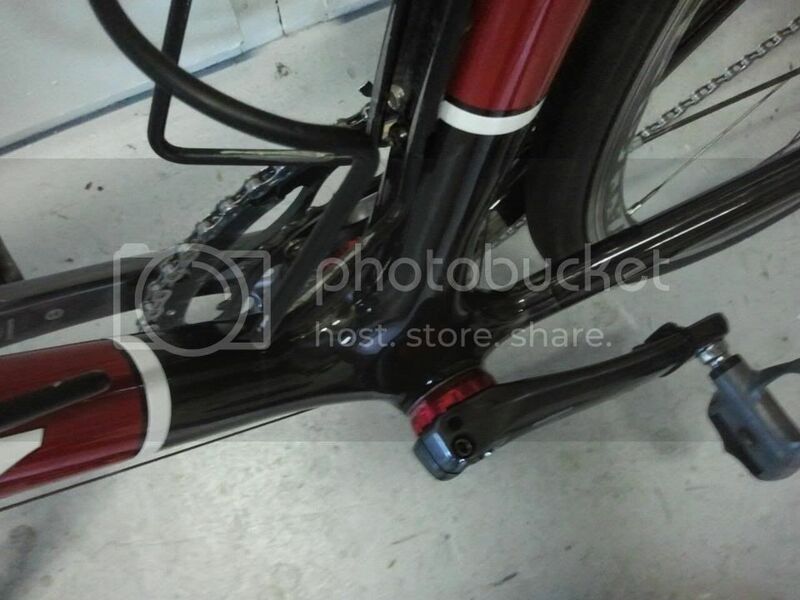 I consulted with my local bike shop and was told by them that Trek would probably deem it a cosmetic blemish and not replace it. 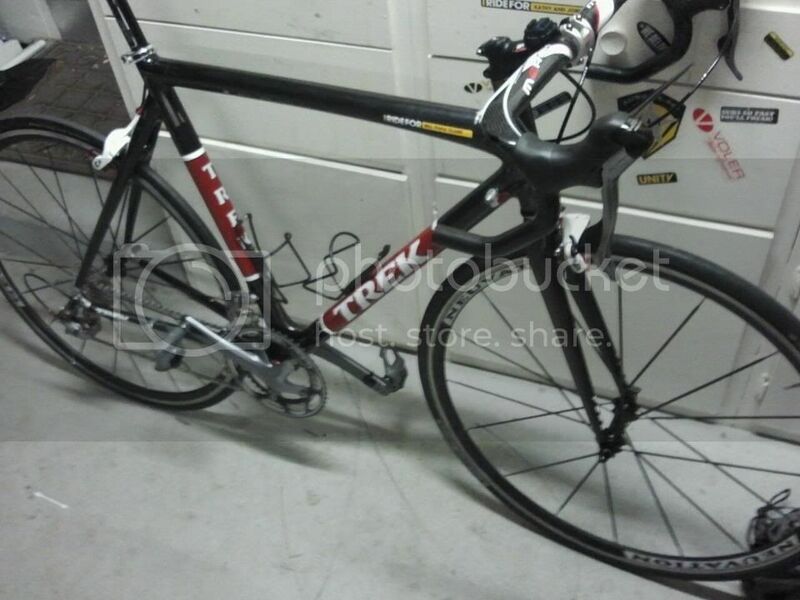 Which is exactly what they said when the LBS owner and buddy of mine called Trek. At this point I decided well F-it, if they aren’t going to honor their end of the deal I might as well paint it the way I want it because what good is their lifetime warrantee now! Over the last 6months I have also been slowly swapping out standard parts for red anodized parts to seriously pimp my ride! Enjoy! 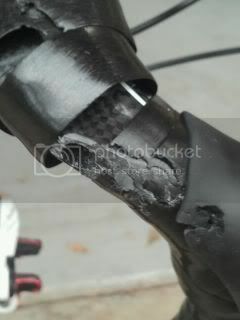 Found a guy through a couple of guys I used to race bicycles with who knows how to work with carbon fiber. Who also happens to only live 45min away from my house! He does AMAZING work with paint. I highly suggest him if any of your are thinking about a new paint job for your whip. He is also well versed in the use of bamboo bicycle construction. He rides a 'Lefty' 29er he built himself out of bamboo as his ride of choice in the dirt. One of the nicest guys you will ever meet also! The narrow red stripes on either side of the red panel had to go!!!!! The final white looks MUCH better! I really didn't plan it this way but the red anadized parts I have been putting on the frame actually look like they match the red paint on the frame quite nicely! 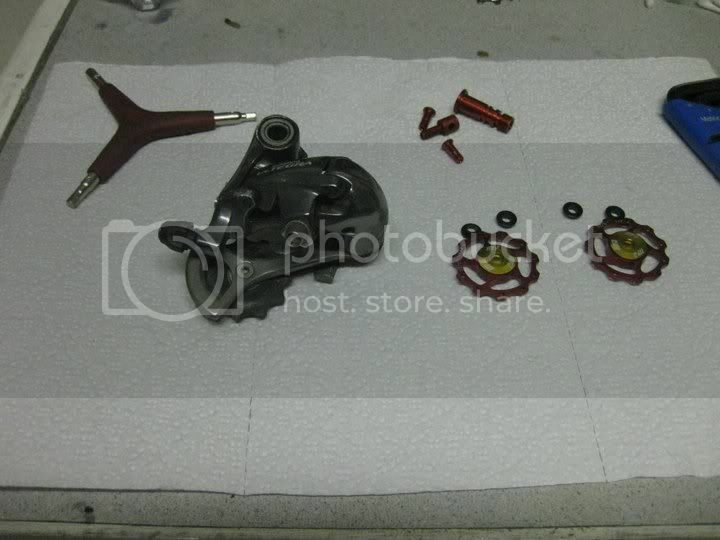 Time to pimp out the rear derailluer! 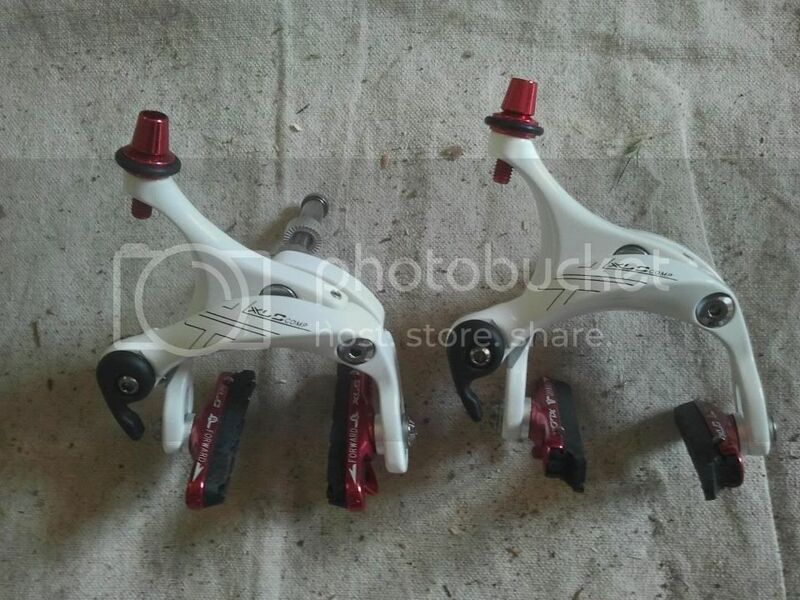 Got lucky with these brake calipers. They were a no name brand from Asia. I was strictly going for the look they would give the bike. 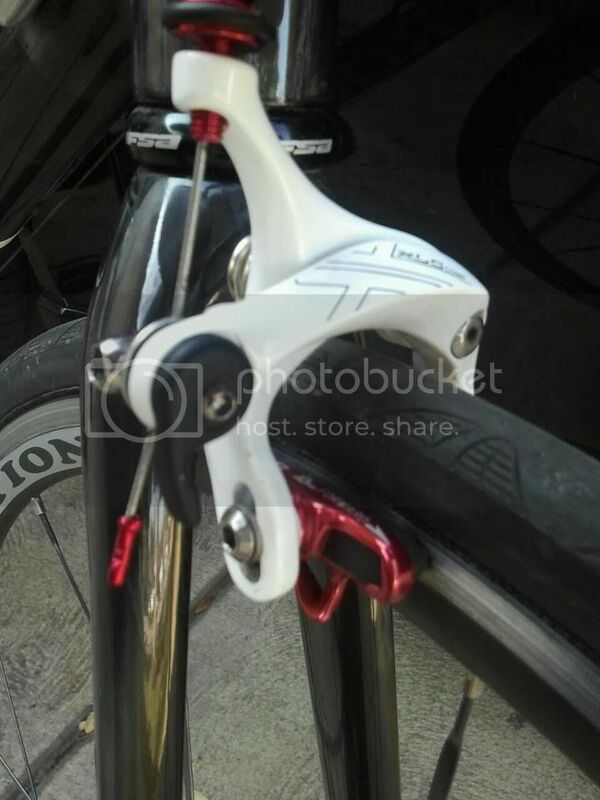 They are actually lighter then the old Shimano Ultegra calipers that they replaced & they so far are providing way more stopping power too! VERY comfortable anatomic/ergo shape! I love these bars! 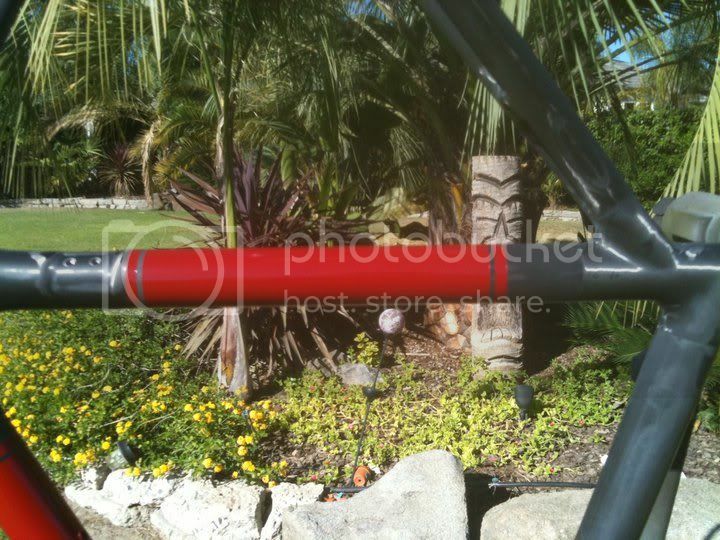 This it the best pic I could get that really shows the final finish of the frame. 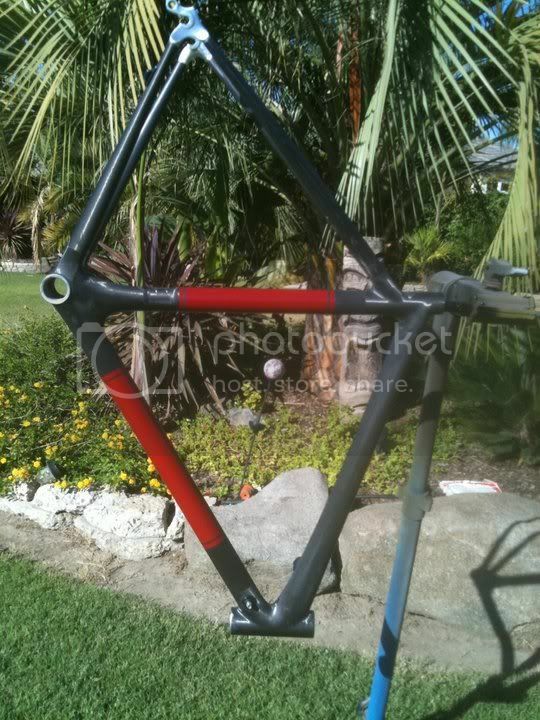 It isn't painted black, it's naked carbon with a clear coat. The carbon weave is VERY fine it is like none other. Pics so far cannot do it justice. It looks AMAZING in the sunshine. 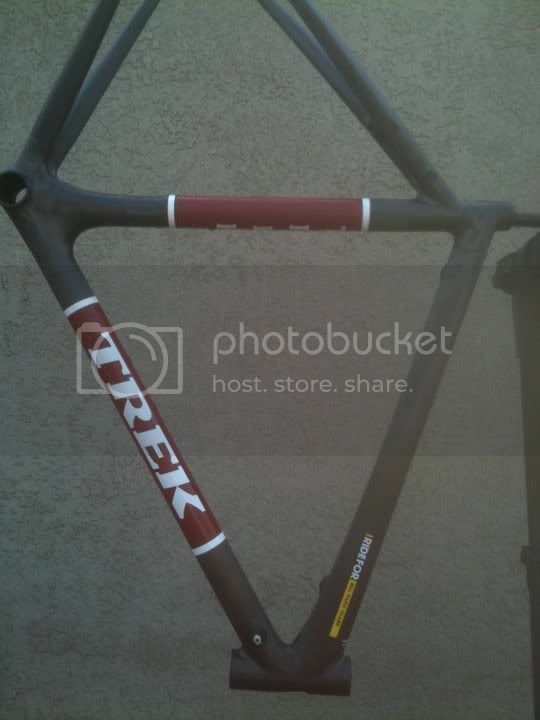 I might have a friend who is a photographer by trade take a turn with a real camera and see if we can capture the true look of the frame. After all these were all taken with my cell phone. It's the little details that count! Yes they do infact make anadized cable crimps! Kinda tricky getting just enough pressure on them that they do their job but too much pressure the finish kinda flakes or chips away. Snapped a chain today while out on a training ride while big ringing up a short, steep sprinter hill. Ended up going over the bars. 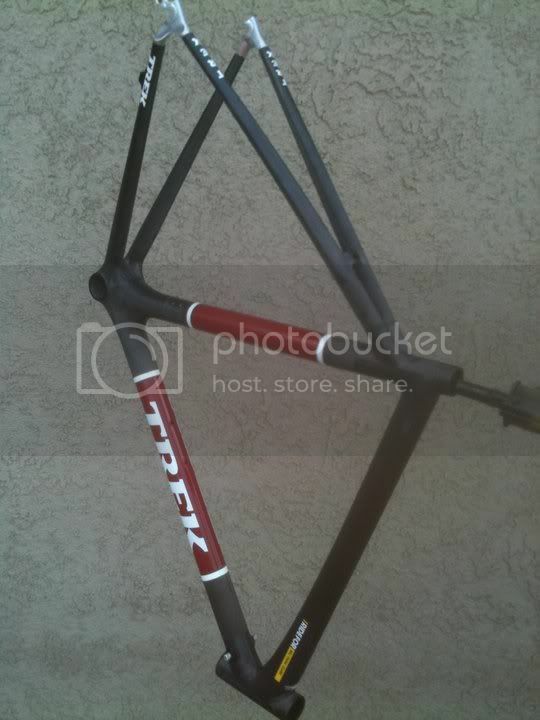 Looks like I will be on the Cross bike for the begining of the 2012 TNT season. So I gotta shift gears a little. 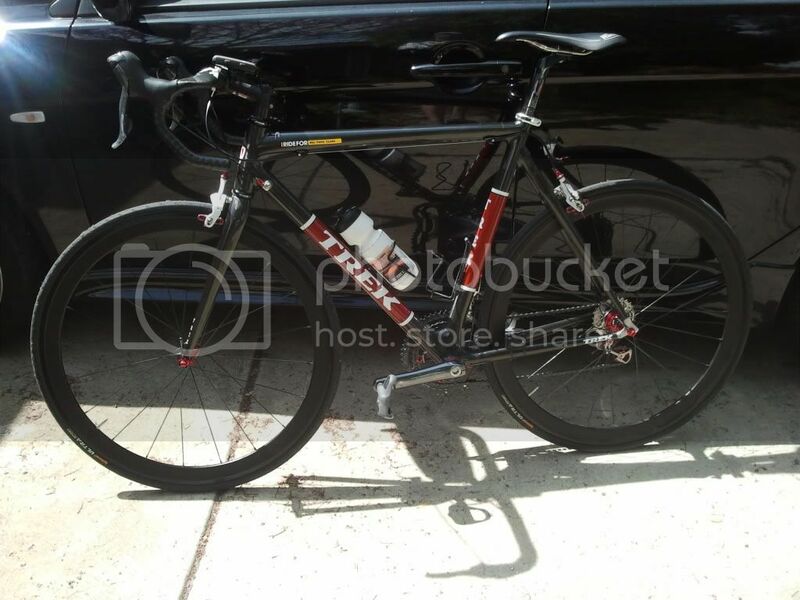 The initial casualty list includes carbon handle bars, front wheel, right brake hood, shifter cable housing, not sure if I have a bent left crank arm or a pedal spindle and the usual handlebar tape. That is unless my LBS find more damages. 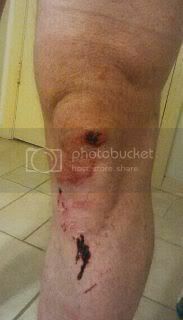 Rode rash cleaned up well, a little swelling but knee feels pretty good. ouch X2. crashn the new built bike what a bummer. 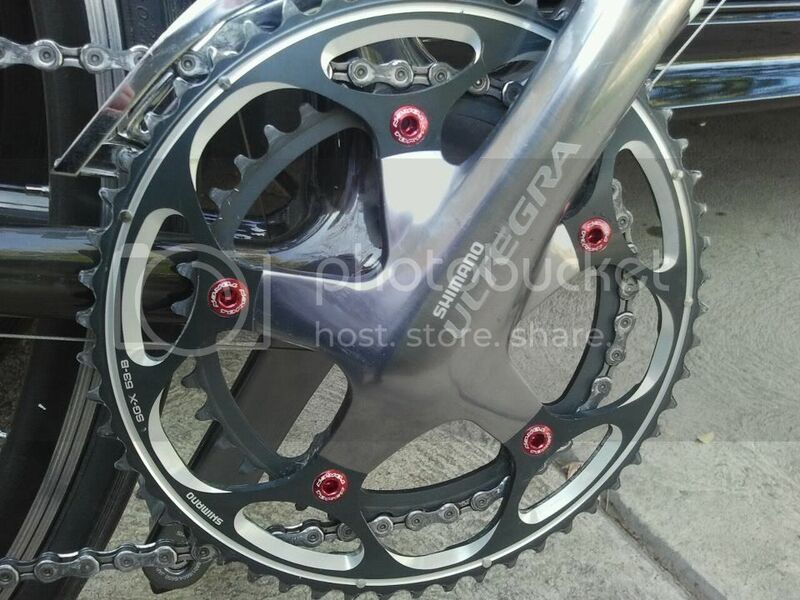 you must have some wattage, snappn chains. I was going to say how gorgeous the bike is and I really like the new ergo bars - they do look comfortable...but it looks like the bike told you who's boss!!!!!!!!!!!!!! Didn't realize you went over the bars...hope the knee is ok.
Knee is good to go. Had to ride about 10mi or so on it no prob. Few of the guys are rolling Thur. I'll be on that ride stradling my cross bike. Gonna be a challenge to keep up! LOL! Went out for a 31mi ride with the boys today over rolling terrrain. Managed to keep up just fine on my Cross/commuter bike. Had to work a LOT harder than usual for obvious reasons. Since the crash I have had 3 weightroom workouts & today's ride. Physically the only thing that bugs me is the small road rash/ chunck of skin missing from the palm of my left hand & the bruised palm that goes with it. It's nothing I can't deal with on a ride but it does annoy. 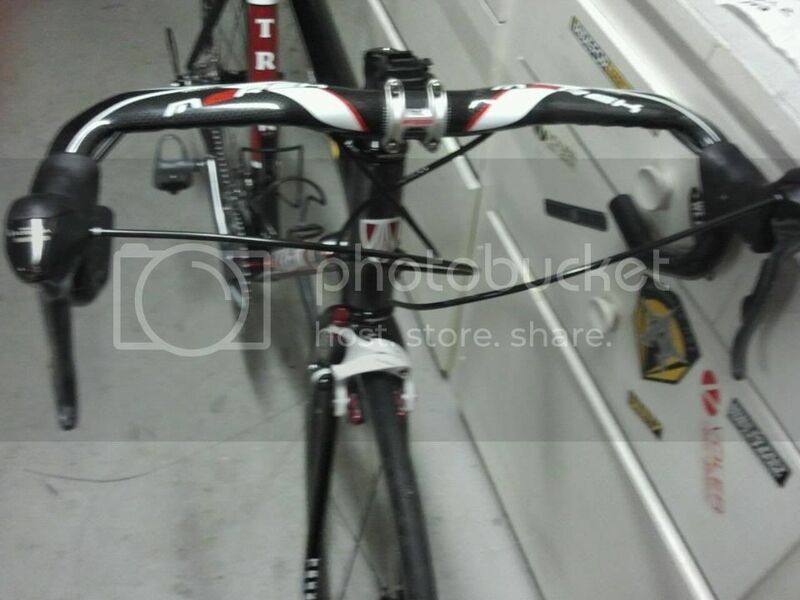 Also had a chance to go through the bike with more detail. 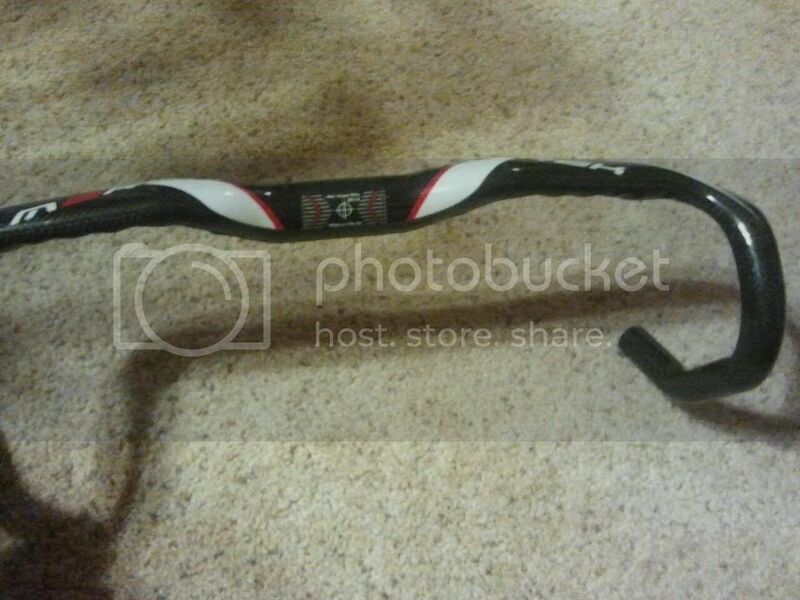 The handlebars are def toast! I found a small crack runningalmost all the way around the bars. It didn't take much force by hand to get the end seperated from the rest of the bar. I rode 10ish mi after the crash & honestly don't know how they held my weight. I was a bit nervous about riding on the hoods & spent the majority of that 10 mi riding with my hands on the tops of the bar but still had to move hand position to the hoods on occasion. 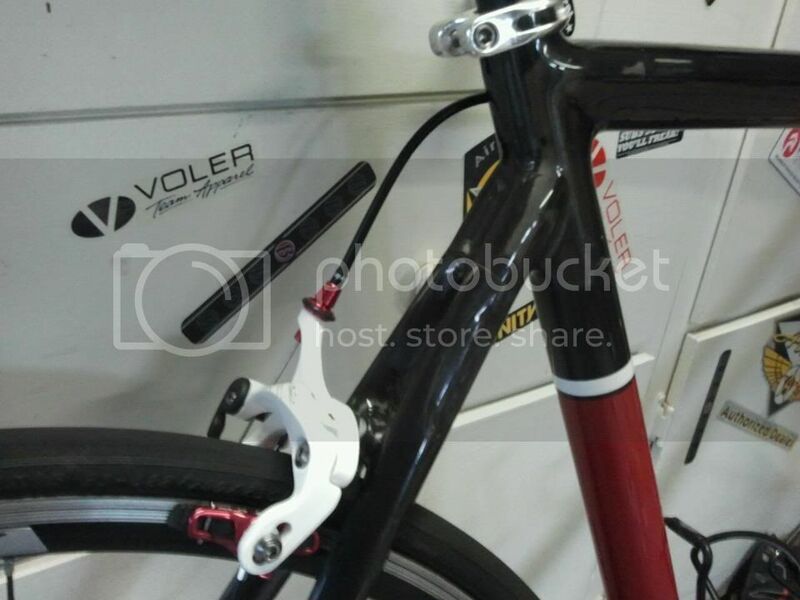 So for sure new bars, bar tape, new cable housing & new brake hoods. 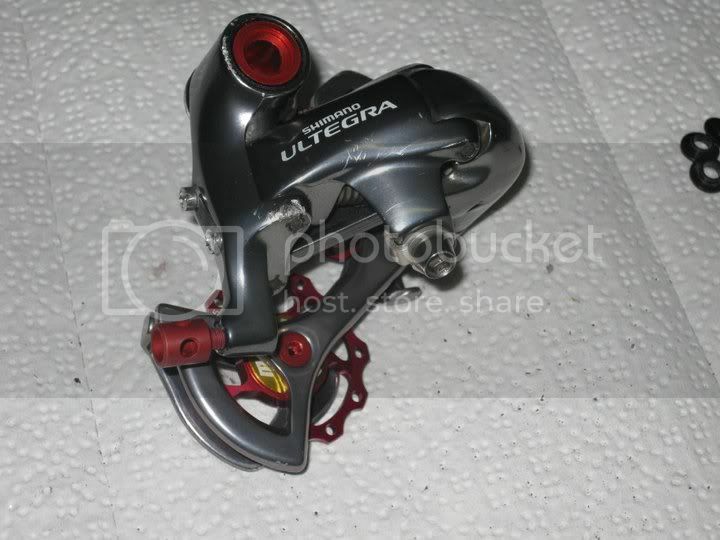 We'll see if the guys at the LBS can work some magic on my wheels. 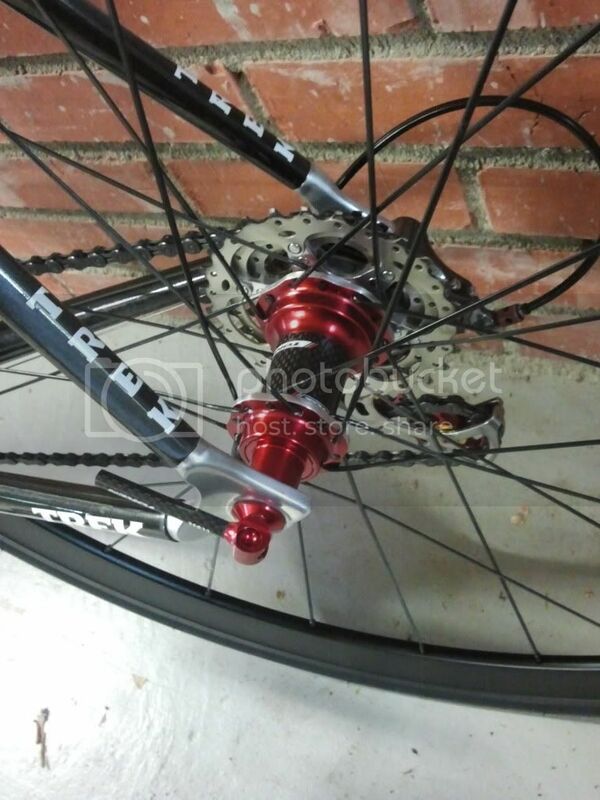 I'm thinking front wheel is toast though. I can't tell by visual inspection whether the left crank arm is bent or if the left pedal spindle is bent or possibly both I suppose so I'm gonna have to take it in to get diagnosed by my LBS. So there is the list of damages. 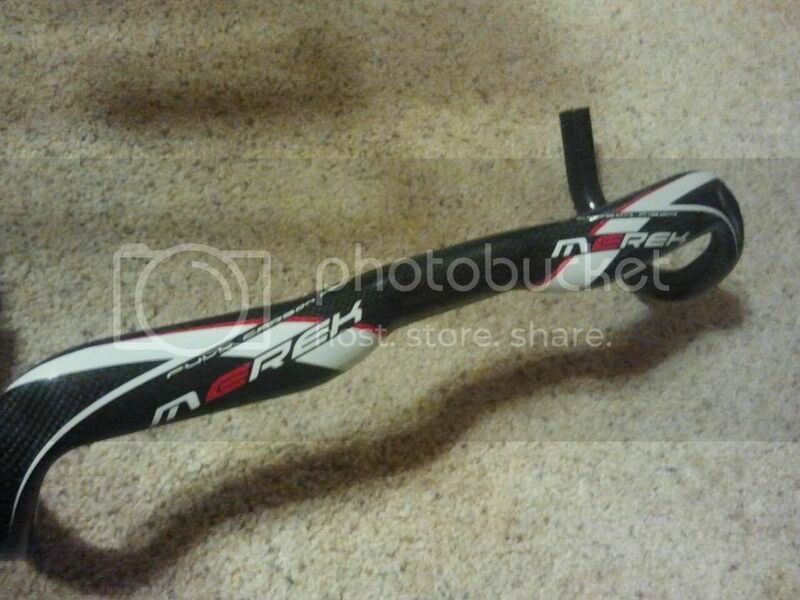 It appears that the frame itself survived without a scratch! 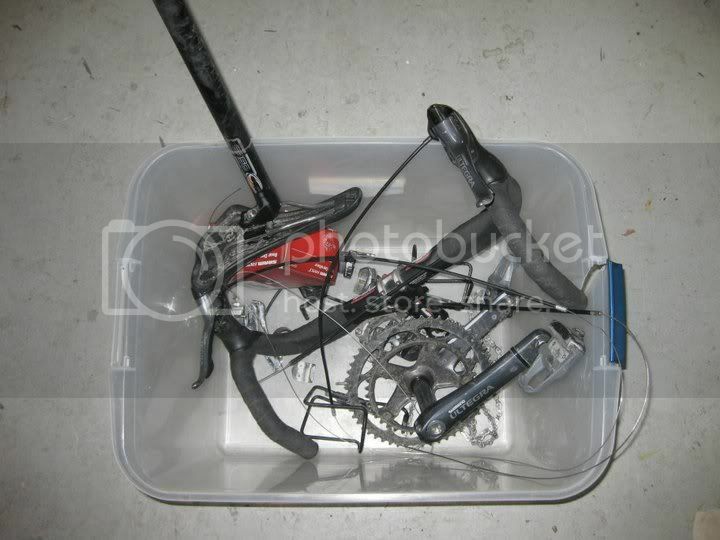 Well the carbon bars held up because its carbon, some of the fibers broke but not all as they're all separate fibers so what you have is a non-catastrophic failure. I know we've all heard carbon fails catastrophically which for anyone who has studied it (me) knows that is totally wrong unless you just go way overload (extreme force) to kill the carbon (like dropping an anvil down on it from a mile up). You only broke it by breaking the remaining fibers with a specific force at that spot. I think its a good sign that the bars got you home, even with some smart riding (not pulling on the bars and putting all your weight into them after the crash). 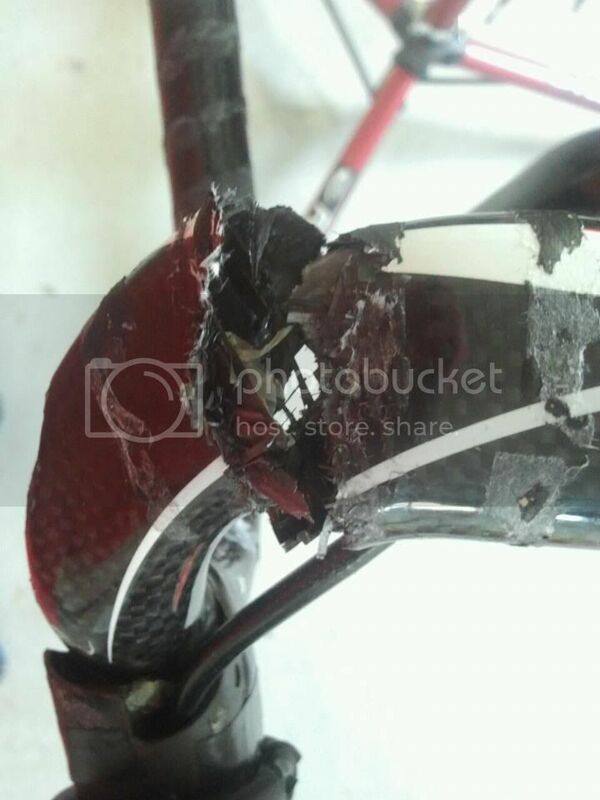 Surprised there's not even a scratch on the frame, lucky! 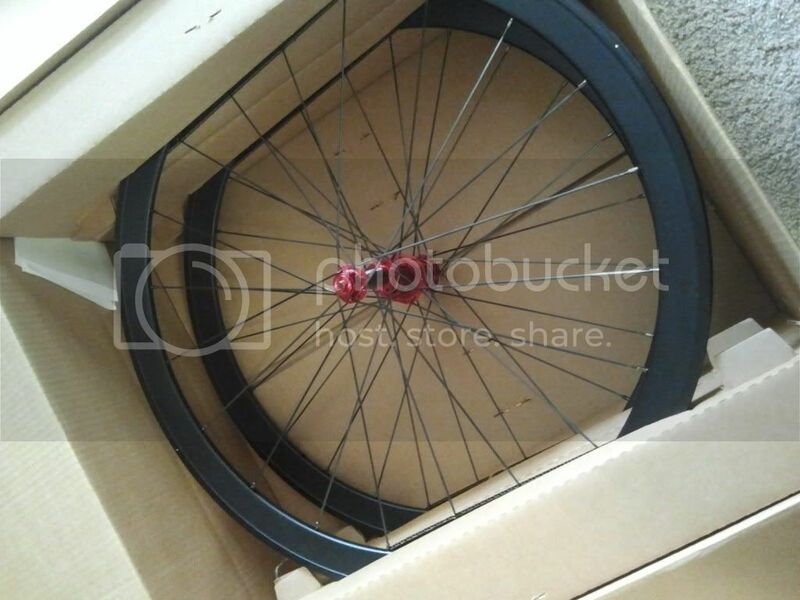 New wheelset has arrived!!!!!! 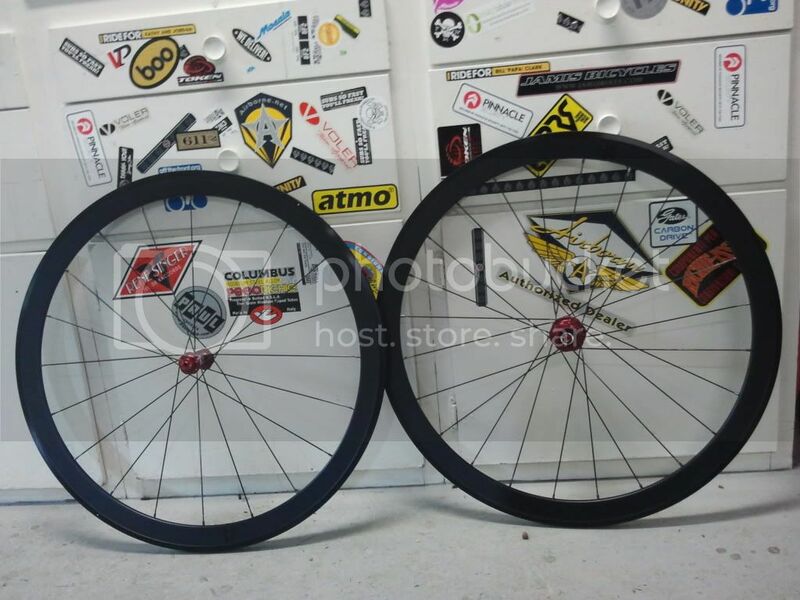 Neuvations were crap and were destroyed in the crash in Jan. New wheels were hand built by Pro Wheel Builder around Token TK520TBT carbon hubset with H Pus Son SL42 black anadized rims and strung together with Sapim CX Ray black bladed spokes. 20 front, 24 rear cross two lacing pattern front and back. It was quite the chore to find aluminum hoops that didn't have a machined braking surface. And ya, ya I know they won't look like that for ever. Frankly I still like that worn down anadized side wall look better than the silver machined look. 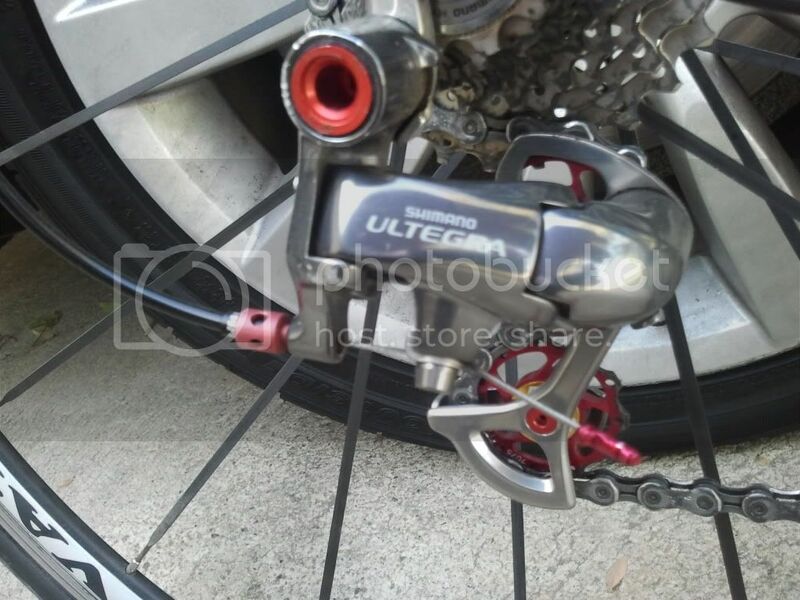 And yes still plenty of stopping power. 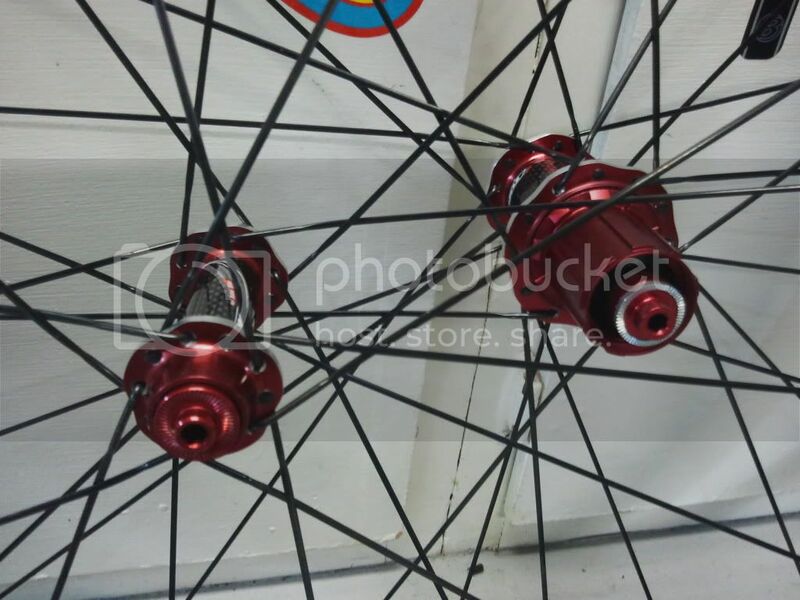 Token red anadized /carbon QR skewers ad a nice touch and compliment the hubset VERY well. Much better look than the old Neuvation hoops that were on it. 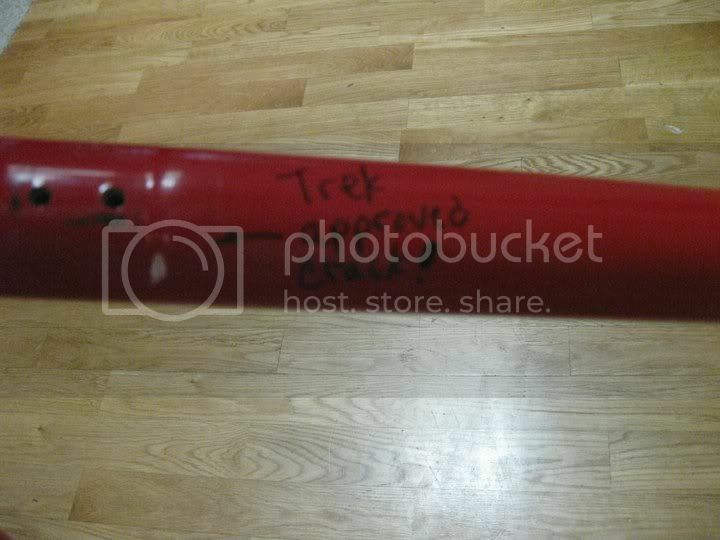 Best looking Trek in town!!!!!!! If I can't be fast anymore I can still look fast!!!! LMAO!!!!!!! Wow - Now it's time to tame the stallion!!!!! Beautiful job and choices Timo, CPR works. 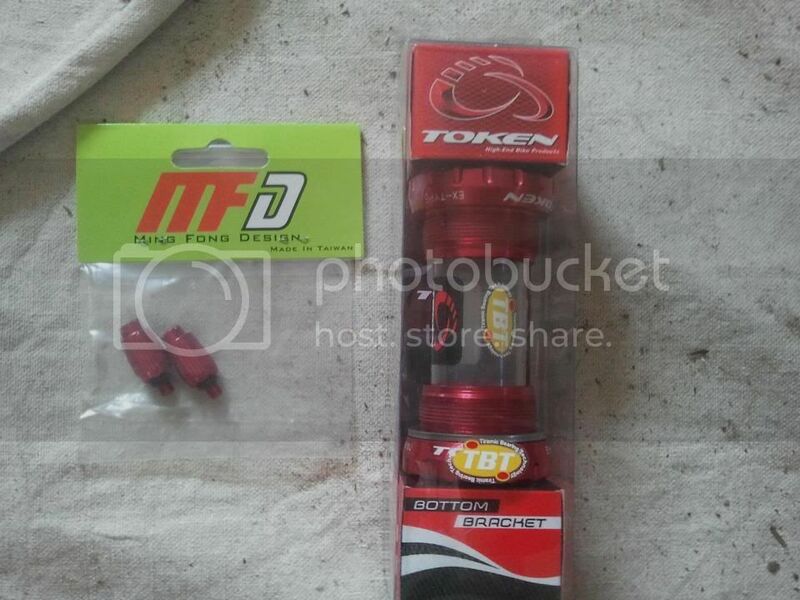 OK now I get to see the wheels and the specs! Interesting choices, too bad the older wheels are gone because its nice or reassuring when you can compare between the two sets. I just switched back to my Ciocc from the older Look and although I like the Look the Ciocc is a much meaner ride, feels like butter and light at the same time. I used the same wheels so I could do a frame comparison without having different wheels factor in. lookn nice. good color choices.